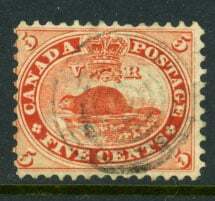 I picked up a small set of the 1859 Canadian beaver stamp (Scott’s #15) years ago. Top qualify ones were out of my budget range at the time, so I looked around for some flawed ones – just so I could have these famous stamps in my collection. Although I couldn’t afford the layout hundreds of dollars for a good stamp, I could afford the “defects”. They are space fillers, but I love them anyway. I looked around for ones with good cancel marks – increases the value in my not so humble opinion. The set displayed here have very visible number obliteration marks. You can research the cancel marks (obliterations) and if you are lucky, figure out where it was sent from. Cancels, in this time period were, well, varied is an understatement. I have some with ring cancels, dates, numbers, fancy cancels and big blobs of ink. Not all have been catalogued and sometimes it’s a guessing game as to the post office that marked them. An earlier 3 penny beaver was issued in 1851, it doesn’t have the perfs and is much harder to come by and much more expensive. The 5 cent issue uses the same design, but it was part of the first set of stamps issued using the new decimal currency. 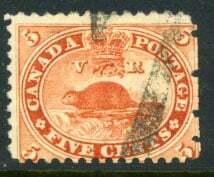 The beaver stamp was designed by Sir Sandford Fleming in Toronto. 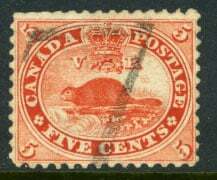 For none Canadians, the beaver was picked because of its historical importance in the development of Canada. You can read more on it here. A mint, with original gum will set you back around $650. But you have to be wary of any old stamp with “original” gum. Many are regummed by unethical sellers to increase the value of the stamp. Always get an expert opinion before buying an original gum stamp. However, if you simply want to have them in your collection, or are a cancel fan, you can pick them up for as low as $2 a piece. A great bargain, lots of fun. The #7 cancels, I suspect came from St. John’s NB. It’s fairly close to a cancel shown in the **Canadian Fancy Cancellations of the Nineteenth Century catalogue. I can’t find a match for the 6 ring cancel (second from last in stamp shown). Post masters often made their own unofficial obliteration marks and not all of them have been catalogued. The ringed cancels were very popular so hard to trace. 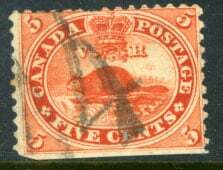 The stamp with the number 4 may have been from Owen Sound. If you look closely, you can make out a number in front of the 4. It might be another 4. If so, Owen Sound is the likely origin. But that’s a bit of guess work on my part. **Canadian Fancy Cancellations of the Nineteenth Century, 1961 by K.M. Day & E.A. Smythies or 2nd ed 1981 can still be purchased, second hand through Canadian stamp collector stores like Ian Kimmerly (http://iankimmerly.com/) for a reasonable price.